THE literature devoted to the subject of dew-ponds is of a very scanty nature, whilst those writers who have dealt with the subject differ considerably amongst them­selves as to the principles, if any, on which such ponds are formed, and also, indeed, as to whether the ponds have any right to be called " dew-ponds " at all. In considering the subject, it is, of course, primarily necessary to recognise clearly how dew is formed, but even in what appears to be such an elementary matter as this there is not a unanimity of opinion. Many meteorologists still maintain the old theory, which is certainly the popular theory, that dew is formed by the precipitation of the aqueous vapour already existing in the lower layers of the atmosphere, when the radiation of heat from the earth has caused its surface to be in the condition to chill below the dew-point the layer of saturated air in contact with it. Precipitated moisture may appear in the form of dew, hoar-frost, mist, fog, or cloud, but in dew and hoar-frost there is precipitation without a cloudy intermediary. Freest radiation of heat from the earth's surface takes place when there are no clouds to reflect to earth the heat which it gives off at night. If there are no clouds, the chilling of the ground and of the layer of air in contact with it will be considerable, and the temperature may be reduced to the dew-point. During the last twenty years the acceptance of Dr. J. Aitken's theory has been rapidly growing, that dew is really formed from the moisture which rises out of the soil with the radiation of heat, and that it is this which is precipitated when the air into which it passes has been so reduced in temperature as to be unable to hold it as aqueous vapour. If this theory be the correct one it would at once dispose of the suggestion altogether that dew-ponds are fed and filled by true dew, since the acquisition of dew could only then be obtained at the expense of itself by earlier evaporation. Messrs. Hubbard, in their " Neolithic Dew-Ponds and Cattleways," give some details as to the formation of these ponds, although the source of their information is not stated. They say that there is at least one wandering gang of men, who will construct for the modern farmer a dew-pond which will contain more water in the heat of summer than during the winter rains. The space hollowed out for the purpose is first thickly covered with a coating of dry straw. The straw is in turn covered by well-chosen, finely-puddled clay, and the upper surface of the clay is then closely strewn with stones. The margin of the straw has to be effectually protected by the clay, since if it becomes wet it will cease to attract the dew, as it ceases to act as a non-conductor of heat and " becomes of the same temperature as the surrounding earth." This would, of course, follow quickly if a runnel or spring were allowed to drain into the pond. The puddled clay is chilled by the process of evaporation, and the dry straw prevents the heat of the earth after a hot day from warming the clay. It is very certain, however, that many alleged dew-ponds are not formed on this plan. 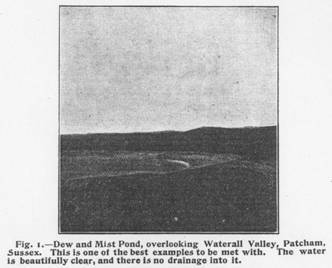 This description, it will be observed, clearly presupposes that dew is formed out of aqueous vapour already existing in the atmosphere, so that if Dr. Aitken's theory is correct, it would seem that a new name is needed to describe water that is precipitated out of the atmosphere in such a case, without the intermediate condition of mist or cloud. Such might be called " invisible mist." Some remarks by G. G. Desmond in the Nature Notes Column of the " Daily News " gave a different arrangement for the basis of the dew-pond. It was there stated that first a bed of concrete is laid down; this is covered with straw, over which is placed another layer of concrete. I have been unable to trace the authority on which this is based. In a private letter from the maker of some ponds on the " Duke of Norfolk Downs " and on Amberley Mount, it is stated that the highest parts are chosen, as they are " more exposed to the weather " than lower down, the inference being that they are filled by the moisture-laden winds blowing in from the south-west, no consideration being given whatever to any artificial attempt to attract dew-precipitation. But as R. H. Scott says, dew can never appear when there is much wind, for the air cannot remain long enough in contact with the soil for any material reduction of its tempera­ture, and consequent condensation of moisture to take place. (" Int. Sci. Series," Vol. XLVI.) The " weather " referred to can only, therefore, be mist or fog. In 1877 Mr. H. P. Slade discarded the term " dew-ponds " in favour of " artificial rain-ponds," and scouted the idea that dew had any part in filling ponds at all. His remarks dealt practically with one pond, the greatest diameter of which was 69½ feet, which was constructed in 1836 at a cost of £40. It was bedded in the Thorpe Downs, near Loughborough, on the Berkshire Hills, at a height of 45o feet above the level of the sea. Being " fed from the heavens," this fact probably gave rise to its being classed as a dew-pond. The basis of this pond was stated to be, first a layer of clay about 12 inches thick (mixed with lime to prevent the working of earth-worms), second, a coating of straw, " to prevent the sun cracking the clay," and, thirdly, a layer of loose rubble. During an interval of 40 years, till 1876, the pond had only once been dry. The exception was in 1854, and this resulted principally from the growth of rushes, whose roots struck through the clay bottom, causing leakage in what was otherwise " a waterproof bed." The straw was not held to have any particular effect in causing dew-precipitation, and the rubble, which would, of course, by the way, allow of the straw becoming saturated, was merely to pre­vent the hoofs of cattle trampling upon and perforating the clay, or puddle, as it is called. Gilbert White's mention of the little ponds on the downs around Selborne is an early reference to this class of pond, but he does not actually call them " dew-ponds," so that the name may have come into use subsequently to his time. He says : " Now we have many such little round ponds in this district; and one in particular on our sheep-down, 300 feet above my house, which, though never above three feet deep in the middle, and not more than 30 feet in diameter, and con­taining, perhaps, not more than two or three hundred hogsheads of water, yet never is known to fail, though it affords drink for 300 or 400 sheep, and for at least 20 head of large cattle beside. This pond, it is true, is overhung with two moderate beeches, that, doubt­less, at times afford it much supply; but then we have others as small that, without the aid of trees, and in spite of evaporation from sun and wind, and perpetual consumption by cattle, yet constantly maintain a moderate share of water, without overflowing in the wettest seasons, as they would do if supplied by springs. By my journal of May, 1775, it appears that the small and even considerable ponds in the vales are now dried up, while the small ponds on the very tops of hills are but little effected.' Can this difference be accounted for from evaporation alone, which certainly is more prevalent in bottoms? or, rather, have not those ele­vated pools some unnoticed recruits, which in the night time counterbalance the waste of the day; without which the cattle alone must soon exhaust them? " White then quotes Dr. Hales as remarking " that more than a double quantity of dew falls on a surface of water than there does on an equal surface of moist earth," but one must remark that this does not necessarily always hold good. J. C. Clutterbuck, in 1865, said that in making such ponds an excavation was made in the chalk on the tops of the hills, from 30 to 40 feet or more in diameter, and from four to six feet deep. The bottom was " covered with clay carefully tempered, mixed with a consider­able quantity of lime. . . ." This was " protected from the action of the sun and atmosphere by a cover­ing of straw." After this " efficient and impermeable coating or puddle " is completed, a layer of broken chalk is placed upon it." It will have been noticed that in Messrs. Hubbard's statement, the excavated hollow is, in the first place, covered by straw, after which puddled clay is deposited thereon, with a strewing of staves on the top of that. I should like to trace the wandering gang of men referred to in their work. I hoped to have hit upon some of them in the summer of 1906, when I found that a pond-maker, who seemed to be well-known, was said to be at Alfriston. I interviewed him on the subject, but only found that the ponds which he made, whether on high or low ground, consisted of an excavated hollow, with a carefully concreted bottom. With thermodynamics he had nothing to do, nor did he show any inclination to advance the cause of science by building a scientific dew-pond. For £30 or £40 he would build one anywhere, but he would choose a site where runnels made their appearance in rainy weather. 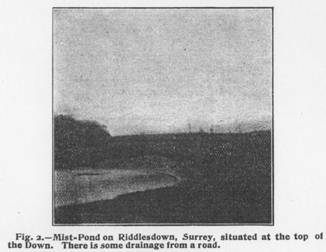 In Johnson and Wright's " Neolithic Man in North-East Surrey," reference is made to the fact that some old Surrey people do not use the term " dew-ponds " at all for these remarkably constant supplies of water which are found on the chalk hills, but call them " mist-ponds," and the more inquiry is made into the origin of them, the more difficult it is to think of the majority of them as dew-ponds in the full sense of the word. It has been attempted with some success to attribute the first formation of dew-ponds to the Neolithic peoples in England, and this has been the view of various writers on the subject, the necessity very early showing itself to such people of having reliable water supplies when besieged or shut up, even though for a short time, in their hill-camps. But, as Pitt-Rivers has pointed out, the time during which such sieges lasted could not have exceeded a day or two at most, and I cannot help thinking that the ponds are more likely to have been constructed principally, if not entirely, for the watering of cattle, this being just as much a necessity in times of peace as in times of strife. The herbage found on the downs was then, there is no reason to doubt, just as sweet and wholesome as it is now, and our flocks are, by preference, still found in immense numbers on the Surrey and Sussex hills, although there are no marauding bands to waylay them nowadays in the lower lands near by. water level has been steadily sinking. The chalk is sometimes likened to a sponge in the way in which it soaks up water, and if this be the case it will not yield surplus water until it has itself been saturated. But then, if the water-level be lowered, as we know it has been lowered, the chalk would still remain saturated if we grant it this soaking power, although above that water-level it would not yield a supply which could be tapped by well-sinkers. In the olden days, therefore, it would not have been any more likely to have given rise to springs than now, and little more than the mere surface drainage, or that part which remained after percolation, would have gone to fill the ponds. Pitt-Rivers also points out that in many chalk districts "there are high springs which run only in the winter, when the hills have sopped up the winter rains, and retained them, like sponges, at the higher levels." (" Excavations in Cranborne Chase," Vol. II., p. 237.) But this can have no reference to summit-ponds, although the statement is quite true, and was probably considerably more so in former times, when forests and woods existed which have since been cleared. Still, if these springs merely flow because the water which supplies them cannot sink into saturated chalk, then the ponds which they feed have no special reason to be called " dew-ponds " at all. Yet, as White informs us, these strange little ponds on the tops of the hills are full when those in the bottoms are dried up; that is, in times when there has been a dearth of rainfall, and this, although it is admitted that the water-level in the chalk has sunk as compared with earlier times. And, as Johnson and Wright say, even in our times the strange spectacle is sometimes seen " of carts being sent up hill to procure water for the granges and bartons in the vale." Be­sides, Mr. J. C. Clutterbuck refers to the fact, evidently admitted so recently as 1865, that the tops of chalk hills are often chosen for sites, where no surface-water except rainfall can furnish a supply. Therefore, as White says, there must be " some unnoticed recruits, which in the night-time counterbalance the waste of the day." What are these recruits? As the ponds have come somehow to be known as " dew "-ponds, it will be well first of all to consider whether dew is one of these recruits. H. V. Slade dismisses at once the possibility of it acting as such. It must be borne in mind, how­ever, that he particularly referred to the one pond only, and in that the straw was laid on the clay or puddle, and the only object of the straw was, according to his statement, with a view " to prevent the sun cracking the clay." He did not suggest that the straw was of use in keeping the water of the pond cool. But Hubbard says that the purpose of putting the straw under the puddled clay is to prevent the clay receiving heat from the earth which the latter has absorbed during the warmth of a summer day. At the same time the puddled clay is chilled by the process of evaporation, and the straw acting as a non-conductor, the moisture contained in the warmer air is deposited in the form of dew. In this way an empty pond will become filledwithout other assistance, the condensation during the night being in excess of the evaporation during the day, until, presumably, the margin of puddled clay around the pond becomes smaller and smaller, and dew deposited thereon ceases to recruit the pond. process of replacement being continued, the net result may be that the whole mass is cooled sufficiently to chill the superincumbent air below the dew-point. In this way a dew-pond, if built on Hubbard's plan, and grant­ing the principles advanced by them, would, after be­coming filled without artificial assistance, continue to receive dew (invisible mist, as I have called it) when partially filled, although the greater part of the clay were covered. Clutterbuck, on the other hand, says that the water must, in the first place, be introduced by artificial means, but in this case we must remember that the straw was placed over the clay, and it was not claimed that the straw in any way attracted the deposition of dew. As Miall says, this seems to be decisive against the sufficiency of rainfall alone, in so far as such ponds are built after Clutterbuck's plan. Clement Reid states that " the open downs, even in the middle of summer, receive much heavier dews than would be expected, or than are met with on the low­lands." But he adds that " thick sea-mists often cling to their top [of the open downs] for several hours after sunrise, while the plains below are already dry and sunny." This brings us to the question of mist acting as a recruiting agent, and one cannot help thinking that this may be of material benefit to the pond. 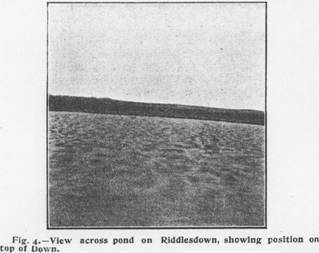 The claim that dew alone is the great cause of the permanence of such ponds receives a shock from an experiment conducted by J. G. Cornish at Lockinge, in Berkshire, and recorded in C. J. Cornish's " Naturalist on the Thames." The temperature of the water in a dew-pond on Lockinge Downs on July 16, 1901, was 200 F. higher than the temperature of the air. Dew, could not, therefore, have been deposited, since the temperature would probably have been maintained throughout the night, but if not, the difference in temperature of the water and of the air would, at any rate, have been accentuated. This would be in accordance with the principle that water, although it takes longer to warm, yet when once it acquires a certain temperature it retains its heat without materially warming the air above it. Water has far less absorbing and radiating power than dry land, and, therefore, would have less effect on the air above it. Mr. K. H. Scott states that " as the specific heat of water is five times that of dry land, it takes five times as much heat to raise a given mass of water through a given range of temperature as it does to raise an equal mass of dry land." Mr. Cornish also records that, on the other hand, five days of heavy dew in April and May, with no fog, raised the level of the same pond no less than 3½ inches. This record is so extraordinary that one hesitates to give it credence, and further similar observations are desirable. Attempts have been made from time to time to measure dew-fall, and Mr. G. Dines, in a paper " On Dew, Mist, and Fog," gave the average of his observations at 1.397 inches, or on the grass alone at 1.022 inches. " Making a liberal allowance for contingencies, it may, I think, he fairly assumed the average annual deposit of dew on the surface of the earth falls short of 1.5 inches." What, then, are we to say to a reported deposit of 3½ inches in five days ? One can scarcely help admitting that the positions of the ponds which are known favour the fact that fogs do add a certain quantity of water to them. The experiments of Mr. Cornish, or, rather, of the shepherd whom he engaged, are very striking. After a night of fog, the surface of his pond was found on January 18 to have risen 1½ inches; the next day, following another fog, gave 2 inches; and on January 24 an inch was measured. It was not recorded what was the principle on which the bottom of the pond was laid. If mist be admitted as a valuable agent in recruiting the ponds, then it is a fit subject for enquiry as to what steps should be taken to encourage the deposition of the mist as water. White admitted that an overhanging beech or other tree was of importance in connection with some of the ponds around Selborne. Clement Reid thinks that an overhanging tree on the side nearest the source of the moisture-laden currents of air is of importance. " When a sea-mist drifts in," in early morning or towards evening, " there is a continuous drip from the smooth leaves of the overhanging tree." The position of the pond now becomes of importance, and if the pond has a high southern or south-western hank it seems to act in a favourable way in causing fog to precipitate its moisture. The Sussex Downs are the home of the dew-pond, and many a time for the whole of a day I have walked through dense fogs which have rolled in from the sea, and have finally taken their flight, as from a jumping-off ground, along the northern ridge of the downs between the Dyke and Plumpton. The trees, where there are any, such as the Holt, near Clayton, will then be seen and heard dropping water on to the leaf-soil below, whilst one's own garments become damp and clammy. One does not like to part from the idea that dew-ponds have been correctly so named, but there is no direct proof that they are so. On the other hand, there is a good deal to throw doubt upon its correctness, since no pond, situated as they are, could fail to receive a great deal of condensation from mists. But I am strongly inclined to think that the use of straw may have a good deal to do with the attraction of moisture to a pond. It is used in India to produce a low temperature and so obtain ice in the open, at night-time. Mr. T. A. Wise has described (Nature, Vol. V., p. 189) a method by which quantities of ice are obtained in the neighbourhood of Calcutta. An excavation of the ground to the depth of two feet is made. This is filled with rice-straw to within six inches of the surface, somewhat loosely laid. Shallow pans of porous earthenware are then filled with water, and as long as the air is comparatively still the ice forms in the pans. The straw is a powerful radiator, and, being kept loose and dry, prevents the heat rising from the earth to the water in the pans. Heat is cut off both top and bottom, and it is stated that the temperature of the air in contact with the dishes is reduced some 20° below that two or three feet higher up. This practice certainly seems to throw some light on the use of straw at home. One thing, at any rate, is certain, that mists contribute largely to these ponds. What we need now is a scientifically-constructed pond on Hubbard's principle as a first experiment. At present I know of no other direct and unqualified statement as to what a dew-pond really is,. 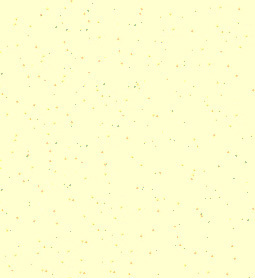 how it is constructed, and why it attracts the dew, and it might; I think, be put to the test. Then if it were successful in collecting water, .with no artificial introduction of a supply in the first place, meteoro­logical observations might follow to show, if possible, the laws which were most potent in accomplishing it.